There are a few variations when making pa tomàquet. Some people make this dish by toasting the bread. The other option is whether or not to use garlic. Usually it comes down to how much effort one wants to put into making this easy appetizer. I recommend both! 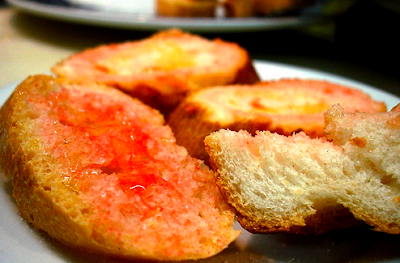 To make this traditional Catalan dish, toast the bread to your liking. Cut the clove of garlic in half and rub it's midsection onto the bread. Then, cut the tomato in half and rub it onto the bread until it is coated red. Last, drip some olive oil and sprinkle a bit of salt onto the bread and serve! 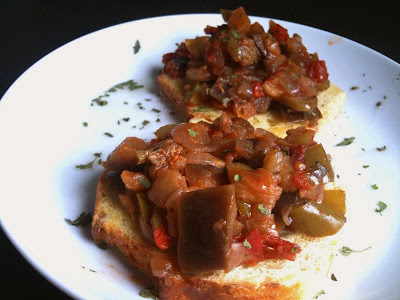 While many people add sausage or meats to their pa tomàquet, roasted red pepper and roasted eggplant/aubergine (called escalivada) are also a common addition to this oh so simple tapa. Mmmmm ... sounds yummy ... I can't wait to try out this easy Catalan recipe. Thanks for sharing ... keep them coming! !